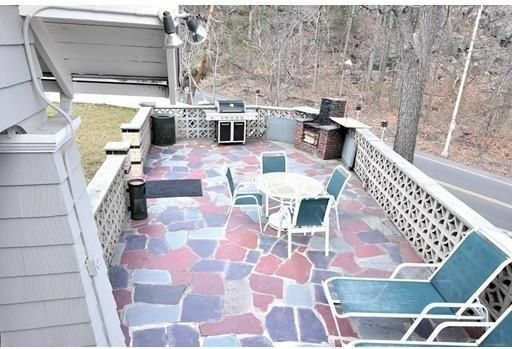 Located next to serene & magnificent Middlesex Fells Reservation in West End of Malden, this deleaded Top of the Hill White Castle provides unobstructed views in all four directions. Fells 2,575 acres offer welcome retreat for city dwellers and suitable terrain for hikers, bikers, skiers and picnickers. Here sits this house like a Great Sphinx. Surrounding thick concrete walls provide protection. Enclosed large grassy yard with blue stone walkway appeases eyes. Patio areas on all sides of house bring joy to a romantic tea time or delicious evening bbq. Ample open space in the house provides enough for two dozen or more children to run around and play hide and seek. Through windows runs a sweet breeze bringing in positive chi energy conducive to writing poems, composing music or simply thinking new. Beautiful mix of modern and traditional kitchen, freshly painted walls and recently done hardwood are welcoming. Finished walkout basement can be in-laws. Courtesy of Devendra Goyal, Davekey Real Estate, LLC. I found this listing at 186 E Border Rd in Malden and would like more information. Thank you. To begin, hover over the map, and click any Boston neighborhood on the map, to instantly learn more about Boston’s many different neighborhoods. We specialize in all the high-end luxury neighborhoods and nearby cities, including: Back Bay, Beacon Hill, South End, Waterfront, Midtown, Leather District, West End, Bay Village, Fenway, North End, Charlestown, Seaport, Brookline, Cambridge, Chinatown, Jamaica Plain, South Boston, East Boston, Brighton, Allston and Dorchester. You can peruse all of the homes for Sale and the apartments, condos and single family homes for Rent. You can see the number of properties available, organized by the number of bedrooms. Get Listing Updates and New Listings emailed to you instantly from any number of neighborhoods. On this page you’ll find photos, information about restaurants, shopping, schools, sale prices, rental prices and much more! Just click the gray “Explore” button for even more pricing information, available properties, and photos. Our Boston Realtors can assist you in buying, selling, or renting the home of your dreams in the best neighborhood for you. Each Boston neighborhood has a unique look and feel – So get a taste of Boston’s many local flavors by exploring our Neighborhoods page. We have a Boston Realtor specializing in each of these Boston Neighborhoods, plus Brookline and Cambridge. “Location, Location, Location” is how the old saying goes. Location is often the most important component in one’s real estate search, and it can take time and patience to figure out what neighborhoods are best for you. After researching neighborhoods on our website, contact us if you would like further assistance in finding what neighborhood will best fit your needs.